Chicken wings, wraps, pizza, stromboli, hoagies, subs, hot and cold sandwiches, and all the sides and fixin's you can think of, Primo will help you make your next party an unforgettable event! Don't forget to ask about our Large Order Pizza Special. 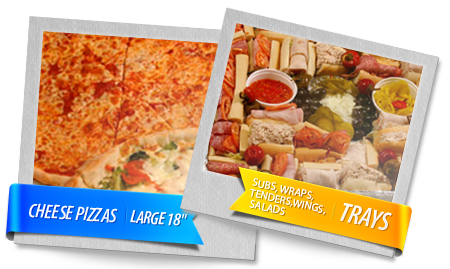 $9 per Large 18" cheese pizza (minimum 5) or Enjoy our famous, mouth watering trays (subs, wraps, wings, tenders, salads)! *Party trays are handled by our Somers Point and Egg Harbor Township locations.